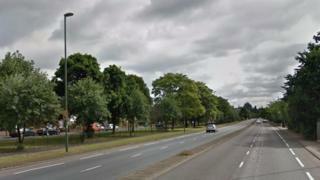 A pedestrian has died and a motorcyclist has been seriously injured in a crash in a Surrey village. The motorcyclist was travelling westbound on the A244 Esher Road in Hersham when the collision happened just after 17:30 GMT on Friday. The pedestrian, a man in his 60s, died at the scene. His next of kin have been informed. The motorcyclist, a man in his 30s, was taken to hospital by ambulance. Police are appealing for witnesses.